On this day, March 14, 1990, at least 16 activists were arrested in Washington, DC during a protest where people were demanding that the federal government pass the Americans with Disabilities Act. There were numerous actions during that week in March of 1990 and one of those acts was organized by the group ADAPT. 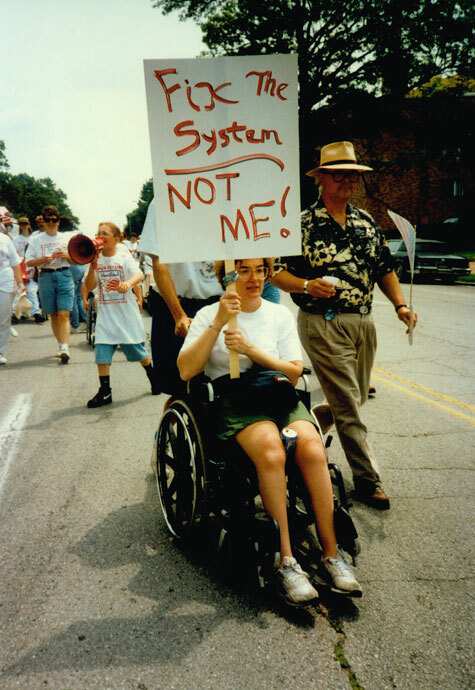 ADAPT is a disabilities rights group that was founded in 1983 and known for using non-violent direct action as a primary tactic for social change. 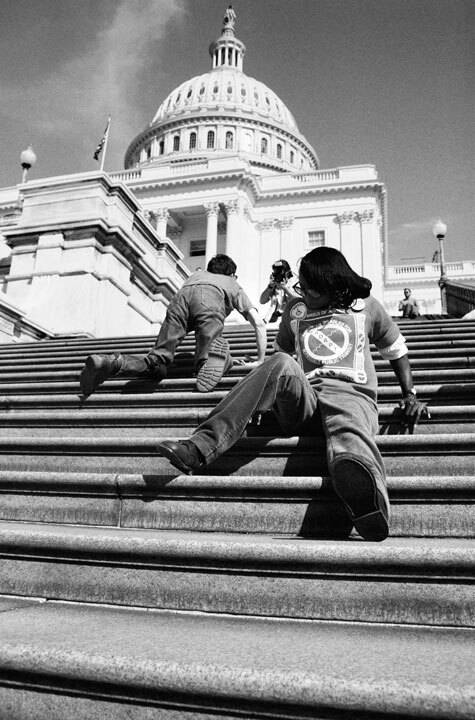 ADAPT organized what they called the DC Capitol Crawl in March of 1990, where people who were in normally in wheelchairs, got out of the wheelchairs and dragged themselves up the steps of the Capitol building in DC. This wasn’t just a symbolic protest against the systematic lack of accessibility in the US for people with disabilities, it was a direct confrontation against the federal government, which also did not make accessibility a priority before they were forced to face the Americans with Disabilities Act. Other actions involved people chaining themselves to buses, since the public transit system did not make it a priority to have wheelchair lifts, making buses accessible to people with disabilities. It was because of these kinds of actions that the federal government finally signed into law the Americans with Disabilities Act in July of 1990. Today, we honor the courageous and committed members of ADAPT and others who fought for more rights and freedom to move about that the ableist world had denied them for too long. My visits to D.C. have been uncomfortable because it is so inaccessible ! I found a lot places only had steps and even cement planters had spike in then so I could not rest.